Healthy dinners that are packed with flavor are always a winner in my book! 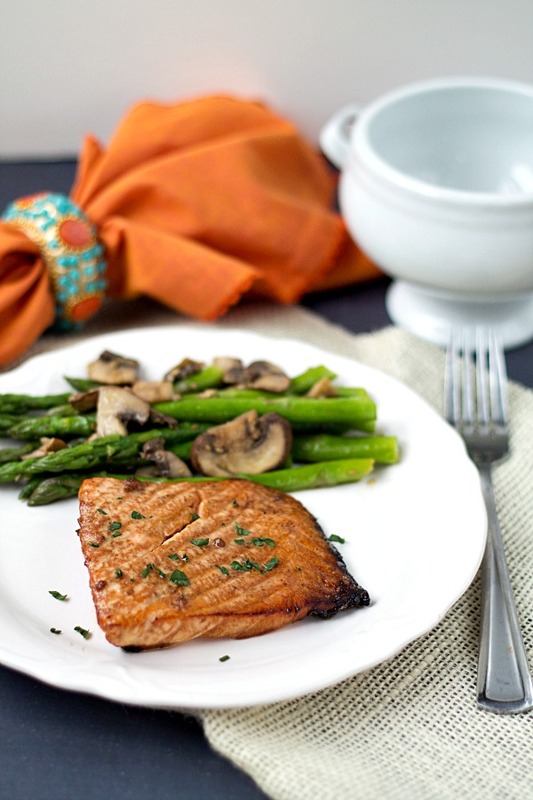 This Teriyaki Salmon with Sesame Asparagus is healthy and delicious. And it’s super simple to make! Summertime and grilling. They go hand in hand. Well actually, grilling and Florida go hand in hand. You can pretty much grill during any time of the year. Now Ken, who grew up in Minnesota, says that you can grill when it’s very cold and snowing outside but who wants to do that? We love our grill. I enjoy preparing the foods to cook on it and Ken enjoys grilling. He’s the grill man. Ha! That’s the silly name that I call him sometimes. Usually when I want him to grill. Maybe in my mind I think it is motivation. However, I don’t think it is. I don’t think Ken thinks it is either. It’s just a silly nickname that I came up with. Trust me. I come up with a lot of those! A couple of weeks ago I wanted to have a healthy dinner. We had been dining out often and I think I may have had two cheeseburgers that week. Say what?! Two cheeseburgers? Yea so a healthy meal was a must have. I turned to one of my favorite cook books, my Better Homes and Gardens New Cook Book, and settled on Teriyaki Salmon for the healthy protein and Sesame Asparagus for the healthy side vegetable. It sure looks healthy doesn’t it? And it’s quite simple to prepare which means you have more time to spend with the friends and family! Enjoy this easy to make Teriyaki Salmon with Sesame Asparagus! Whisk together all ingredients minus the salmon. Rinse salmon and pat dry. Place in a baking dish. Pour the teriyaki sauce over top of the salmon and marinate for about ½ hour. Place each piece of salmon on a piece of aluminum foil (individually) and then brush some of the marinade on top. Grill on medium indirect heat for about 10 minutes or until opaque. Do not overcook or you will have chewy salmon. No one wants that! Steam the asparagus. I used a microwaveable steamer. It took about 4 minutes to steam. Melt the butter in a saute pan. Add the mushroom and sesame seed and cook until the mushroom is tender. Add the lemon juice, sesame oil and soy sauce. Mix well. 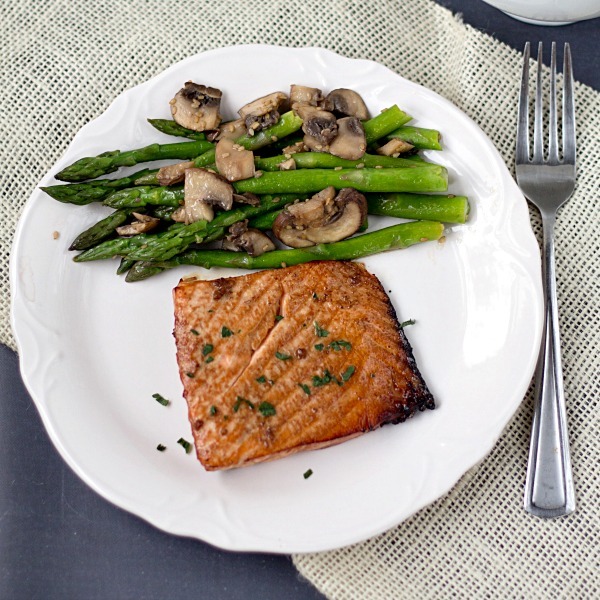 Place the steamed asparagus in a baking dish and pour the mushroom sauce over top. 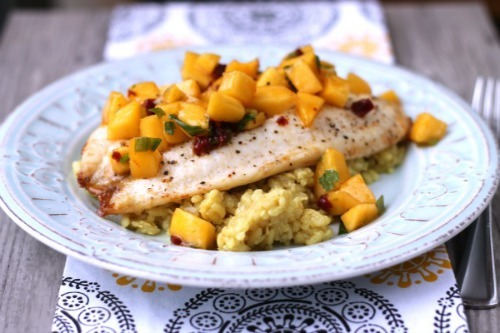 This is the perfect, easy meal to add to your weekly meal plan. Don’t want to use asparagus as your side? Simply substitute broccoli. Broccoli tastes great with sesame sauce! 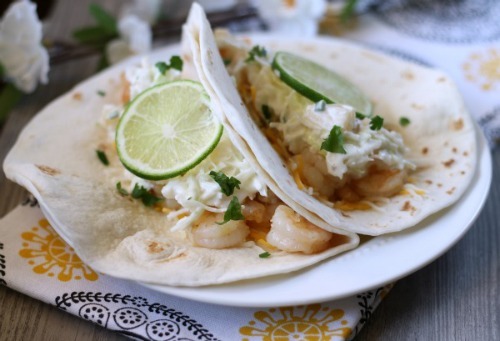 « Previous PostSummer Crock Pot Recipes & A Giveaway! This is one of my favourite ways to have salmon! It looks fab! Love that you made your own sauce! Love healthy dinners and this one looks so fresh and delicious. Thanks for sharing Julie. Salmon is my favorite fish – and I love the Asian flavors! From what I understand, we can pretty much grill year round here in Phoenix, too! We’ll see this winter! :) Pinned this, Julie! Thank you, Jamie! I think you are right about Phoenix. I’ve never been there but I’ve been to Las Vegas, which I believe is a similar climate. During the time I was there, which was late December, early January, the days were mild and the nights/mornings were chilly but it was bearable! I eat salmon often, and love it teriyaki style! Roasted asparagus is terrific with mushrooms, too. This is the meal for me! Glad you enjoyed this, Marcie! Teriyaki is such an awesome flavor! Oh My !! My mouth is watering ! Looks delicious and it is so healthy !! 2 cheeseburgers in one week? My husband would be so jealous…Yay for healthy meals made by YOU! ;). Haha, yes, not my finest moment but it has happened before! Thanks for stopping by, Min! Nom nom nom. Lurrrrve me some salmon and teryaki is just yummy. Pinning and sharing and all that yadda. Teehee! I love when people say NOM NOM NOM. I like to say it too! Teriyaki is made of all sorts of win. You can’t go wrong with it…wait, I guess you could. I don’t think it would taste too great on ice cream. LOL. Thanks for pinning and sharing, Claire! Wow! I love Teriyaki Salmon, the combination of the orange juice, ginger, and honey probably makes that salmon sing! Can’t wait to try it. Pinning and sharing! You know, I think I did hear it sing after we put it on the grill. ;) It’s such a good combination. I love teriyaki sauce, soy sauce, sesame sauce. It’s all so good and packed with great flavor! Thanks for pinning and sharing, Krista! I’m always looking for new ways to season salmon!! Thanks! You’re welcome, Shiloh! Thanks for stopping by! 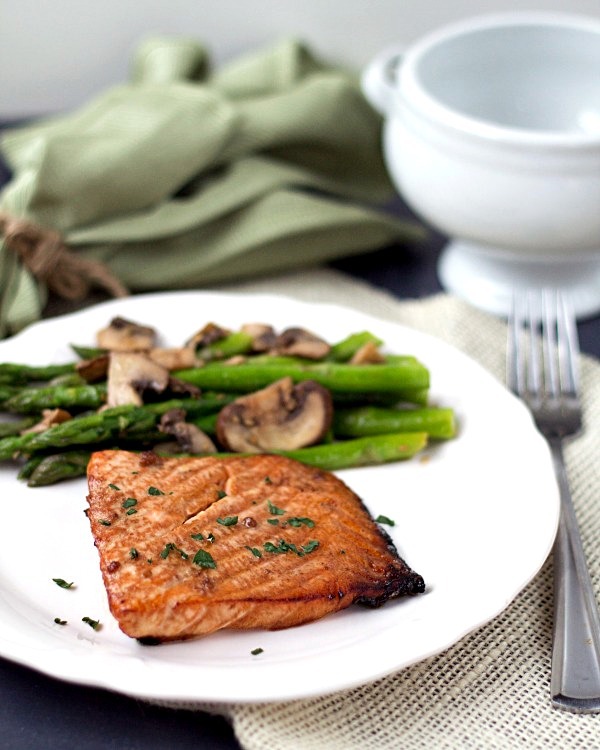 Discovered your blog through foodgawker and I love the healthy plate with salmon. We enjoy salmon, the teriyaki glaze sounds wonderful. Hi there! Thanks so much for stopping by! The teriyaki glaze is excellent! Much better (and healthier) than the store bought glaze! We’re like how Ken was, we grill all year long! And, our winters are so cold. We grill the turkey on Thanksgiving every year. Some years, it’s gotten down to 4 degrees!! It just means MORE coals on the grill. But definitely not hanging out there. We actually have a remote thermometer so we don’t have to go out as much. Love how appetizing this salmon looks. My boys really love teriyaki. So, they love this dish! Pinning and printing out the recipe. Glad your boys will enjoy this! Have a good evening! What a beautiful pairing, Julie! It’s definitely my kind of meal! Want to know a well known secret? I’ve never even seen snow! *sigh* Maybe one day this Florida gal will get out of the state during the winter to a place where it is snowing! I love salmon,and anything Asian :) Looks delicious Julie! Thank you, Lisa! Salmon is my favorite type of fish. It’s so good and it’s never dry…unless it gets over cooked! I like the orange juice in teriyaki sauce – I should give that a try next time! 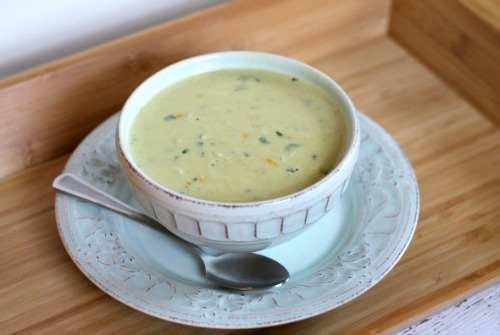 Healthy and light meal – this is definitely a winner in my house. We eat salmon often and kids love salmon dishes! Julie, this looks delicious! I love salmon and asparagus. Thanks for sharing your recipe and of course, pinning and buffering. Have a great Thursday! Sometimes I really crave a healthy meal too! Salmon is probably my favorite fish and luckily, my kids love it too. I haven’t grilled it in some time, think I’ll have to add this to our menu! Great recipe Julie! I love fish and asparagus, I love experimenting with sauces. So obviously I must try this.